Rangzen Alliance » It’s Not the Economy, Stupid! 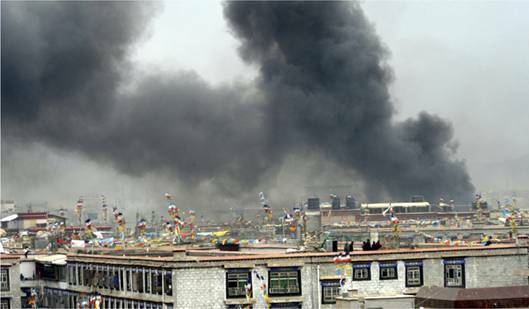 There can be no doubt that the Lhasa protesters were sending a political message through their actions. By not looting but instead burning Chinese products they were simply saying, “we don’t want Chinese products and we don’t want the Chinese in Tibet.” One could perhaps view their action as a variation (albeit an angrier and less Gandhian one) of the burning of English clothes and products by Indian nationalists during the Swadeshi movement. In spite of the unmistakable political message from Lhasa there were attempts in the western media to interpret the protests largely in economic terms – Tibetan dissatisfaction growing from the absence of economic opportunities because of the large-scale migration of Chinese to Tibet, exacerbated by the new railway. Abraham Lustgarten in his flippantly titled “It’s the Tibetan Economy, Stupid” in the Washington Post (March 20) went so far as to assert that “more than violations of human rights and religious freedom, lack of economic opportunity fueled the riots in Tibet last week”. Of course no consideration of Tibetan nationalism was remotely entertained as a motive for the uprising. India’s struggle for independence and many of Gandhi’s programs as the Swadeshi movement, Khadi, the spinning wheel, and even such mass action as the Salt March were expressions of Indian opposition to British economic exploitation of the Indian masses. But none of those, in any way, detracted from the larger message of Indian independence. Tibetans inside Tibet appear to have come around to that realization since 1987, and indeed aspiring Tibetan Jeffersons and Paines had expressed their ideas in a number of documents (See Elliot Sperling’s “The Rhetoric of Dissent: Tibetan Pamphleteers” 1994). The most important political document of that period, sometimes referred to as The Drepung Manifesto, was authored by a group of Drepung monks and printed in the traditional manner with wooden blocks, as a eleven-page pamphlet. It is as clear a declaration of independence as you can get.